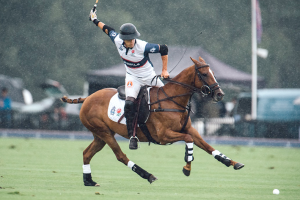 The Royal County of Berkshire Polo Club in Windsor, England is gearing up to host The International after the Hurlingham Polo Association named the Club, the Home of English Polo. The International Day has always been one of the highest profile sporting events in the British summer calendar and as always, this world-class day will be one of the stand-out social events of the year. The Westchester Cup was created in 1876 and is always played for by teams from the USA and England. It has only been played four times since the Second World War and is currently held by England who won in 2013. Following on from last year, a Ladies International, featuring Flannels England Ladies will also be on the schedule, highlighting the importance of women’s polo across the globe. The club are also delighted to announce that Charlotte Dujardin CBE, three times Olympic Gold Medalist, European and World Champion in the sport of Dressage will give a through the levels master class on International Day as she demonstrates her training techniques with a range of horses. The move is part of a long-term strategy by the Club’s Chairman to bring the equestrian disciplines closer together and to encourage new audiences to immerse themselves in Polo. “We are delighted that this prestigious trophy will be competed for here at the new hub of English polo on our first International Day. It is going to be a very exciting and truly an international day with the Flannels England team versus the USA first, followed by the Flannels England Ladies team playing for the Diamond Jubilee trophy. We are thrilled to host these two World class matches” Jamie Morrison – Chairman of Royal County of Berkshire Polo Club. Ahead of the much anticipated Lycetts Festival of Hunting, the event’s title sponsor Lycetts offer an introduction to hunting. 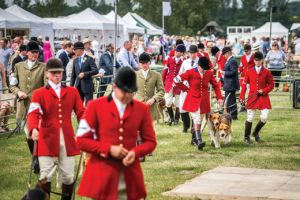 Lycetts Festival of Hunting, which takes place at the East of England Showground on Wednesday 18th July, is an annual showcase for the world of hunting and the countryside community, boasting the greatest gathering of hounds in the UK. The prestigious event also includes the Peterborough Royal Foxhound Show, which celebrates its 130th anniversary this year. At Least One of You Should Know What You Are Doing! – A novice rider on a novice horse is frequently going to find the day a challenge. The happy hacker who has never put a foot wrong may become so excited by the day that they behave entirely differently to normal: pulling like a proverbial train or barging and pushing. It is often best to hire an experienced hunter for the first few days until the rider knows the form. Be A Gracious Guest – Meets are not provided by the hunt but by individuals. The often lavish provision of drinks and food is due to the generosity of the host and it is therefore always polite to thank them when leaving the meet. Listen Out for Calls of ‘Whip on The Left’ or ‘Huntsman on The Right’ – This is a signal that hunt staff will need to pass and should be given priority. Make sure one’s horse is facing them and the hounds as they pass. Never allow the horse’s rear end to be facing the hounds. Volume Control – While chatting with other riders is key part of the day, there will be times when the Huntsman and Field Master need to listen carefully to what is going on. They will not appreciate loud conversations at these times and so it is always worth being attentive. Jump – In hunting circles the word ‘jump’ is a verb and not a noun. Those in the know will talk about ‘jumping fences’, not ‘doing jumps’, despite fences often being referred to as hunt jumps. Hunt – A ‘hunt’ is the collective noun for the institution. It is also the period of time the hunt is actively following a trail. It does not refer to the day (which is called a ‘day’s hunting’). Run – The active period of following hounds as they follow a trail across country is referred to as a ‘run’. Country – The word ‘country’ is used by hunting people to describe the geographical area over which a hunt operates with two distinct meanings. It can refer to the type of ground a specific hunt usually crosses or it can refer to the actual geographical reach over which they hunt. Each hunt has a clearly defined country within which its meets are held. Good Morning / Good Night – Hunting people will greet each other at the beginning of the day with ‘good morning’ and, whatever time they go home, they will say ‘good night’. This is just the way it is and does not mean they have lost their marbles. The man in scruffy tweed and wellies who holds open a gate is quite probably the owner of the farm or estate on which the hunt is taking place. Greet every person on this basis and novices won’t go wrong. Not every good hunter would fare well in a showing class. Not judging by appearances also applies to horses. Sometimes the ugliest of animals will be a spectacular hunter. Amateur hunters can usually spot these horses by the warm greeting other riders give them, often referring to them by name. Follow the elderly fellow in the faded coat. When crossing difficult country, do not follow the dashing man on the fine steed, but rather the elderly fellow in a faded coat who knows every inch of the country and will know the safest crossing places. He or she will neither waste time nor energy, preserving these for a serious run and they will invariably be right up there at the end. Masters and Officials – Once the day begins, everyone is equal. But some are more equal than others! These are the Masters and Officials who run the day. The Huntsman, Whippers In and the Field Master should be easy to spot. The next most important person is the Hunt Secretary who will welcome hunters as they arrive and collect the cap. This is the money hunters pay at the beginning of the day, which goes towards the management of the hunt, including looking after the hounds. Thrusters – These are the people who ride at the very front of the field, usually as close to the Field Master as they can get. They will dazzle with their courage and impress with their tenacity. Many of them will be very experienced and skilled riders. However, they may not be the best people to emulate. Newcomers to hunting will learn a great deal more if they observe more modest riders who watch hounds and conserve their horse’s energy. 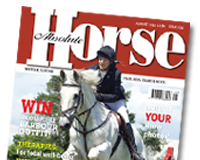 Children – Younger hunters on small ponies may appear sweet, yet never underestimate them. Many will have been hunting since they were toddlers and will out-gallop and out-jump the best adult riders. They are easy to spot by the determined glint in their eyes and their quiet manner. Follow them at your peril! Pilot – Newcomers will quickly learn that some people never refuse at fences. Outward appearances may not make this obvious. For those wanting to follow someone over a fence who is going to give ones horse a good lead, be attentive and work out who is a good pilot and, if possible, slot in behind them. A good indicator is a quiet rider on a happy-looking horse. The rest – Old hunting prints would have us believe that almost everyone dazzles and jumps their way across country. In fact, there are often more who don’t do this than those that do. Surtees once said: “Happy are they who hunt for their own pleasure – and not to astonish others”. Within every hunt, there are those who simply ride at their own pace, go through the gates and avoid difficult situations. They may not astonish others, but they will certainly be enjoying themselves. Lycetts Festival of Hunting is organised by The East of England Agricultural Society, in association with Addo Events. The event takes place on Wednesday 18th July, at the East of England Showground, Peterborough. 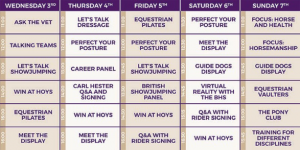 Horse of the Year Show is proud to present the HOYS Live Zone for the second year running with some new and exciting talks and demonstrations. The HOYS Live Zone is located in the HOYS Retail Village at Horse of the Year Show which takes place the NEC Genting Arena Birmingham from 3rd – 7th October this year. The staged area which was introduced last year will incorporate a fabulous line up of guest speakers, interactive sessions, celebrity rider signings and talks from leading industry experts providing visitors with the opportunity to get more involved than ever before. Special Guests Announced For Horse Charity’s Open Day! Two special guests will be making an appearance at Redwings Horse Sanctuary’s free open day on Sunday 15th July. Adoption Star donkey Esther will be welcoming visitors to Redwings’ Hapton headquarters, south of Norwich, when the horse rescue charity hosts a day of tours, demonstrations, food and fun this month. Esther was just two months old when she was rescued from the horrors of Spindle Farm, Amersham, in January 2008. She was so weak from the neglect she had suffered that when she arrived at Redwings she had to be carried off the horsebox. Now happy and healthy, Esther lives at Redwings’ Caldecott visitor centre, near Great Yarmouth, but is making the special trip to attend the open day in commemoration of the 10th anniversary of her rescue. 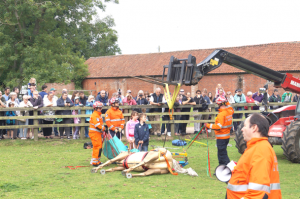 Norfolk Fire and Rescue Service will also be returning by popular demand to give a fascinating and dramatic demonstration of how they rescue animals in tricky situations using one of their training model horses. Although Redwings has visitor centres across the UK, its headquarters – home to its largest Rehoming Centre and Horse Hospital – opens just once a year to the public. Redwings’ Chief Executive Lynn Cutress, said: “We’re delighted to be welcoming Esther to our Hapton Open Day. Ten years ago, the image of this little donkey being carried off the horsebox became a global symbol of the neglect that took place at Spindle Farm. “Today she remains an inspirational symbol of the recoveries made by so many of the Amersham survivors and the happy lives they now enjoy. We can’t wait for people to meet her and find out more about her story in this special anniversary year – and we know she will adore all the fuss and cuddles too! The open day, which will run from 10am to 4pm, will include tours of the hospital by Redwings’ own veterinary team, including a special tour designed just for young children. During the vet tour, everyone has the chance to meet rescued horses and donkeys and find out how the charity cares for its 1,500 residents – of which almost 350 live at its 350-acre Hapton site! Redwings’ rehoming team will also be showcasing how the charity trains its horses – many of whom arrive at the Sanctuary either semi-feral or having never been handled – with the aim of helping them find loving new homes outside the Sanctuary as part of the charity’s rehoming programme. And there will be plenty of opportunities to get hands-on with the horses with pony grooming and self-guided walks around the centre’s paddocks, so don’t forget your good footwear. Look out too for cheeky mascots Red and Wings who will be dropping by to meet everyone! After all that fun, visitors can relax with their pick of hot and cold refreshments, as well as browse a bring ‘n’ buy sale, a tack sale and Redwings’ own pop-up shop full of exclusive gifts with all proceeds going towards the care of the charity’s rescued residents. Redwings Open Day is completely free and will take place on Sunday 15th July, from 10am to 4pm, at Redwings Hapton, Norwich, Norfolk, NR15 1SP. 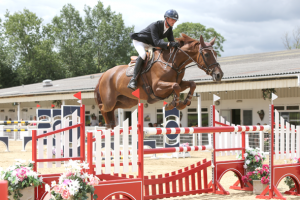 The College Equestrian, Keysoe, Bedfordshire, gears up for three days of scorching hot competition as global stars line up to compete in this week’s CSI** and CSIYH1* from the 3rd – 5th July. Riders from ten Nations, including Olympic medallists and recent Global Champions Tour winners line up to compete in the venue’s first jumping International of the year. Former World Number 1 and London 2012 Olympic Gold Medallist Ben Maher tops the entry list for the CSI**. Essex based Ben heads to Keysoe with former Villamoura CSIYH* winner F One USA. Ireland’s Shane Breen competes off the back of a Global Champions Tour Grand Prix victory in Monaco this weekend. From the golden beaches of the French Riviera to the golden fields of Bedfordshire, the world ranked 50th rider brings forward Clintofino, Colmar and recent Hickstead Masters Trophy winner Clyde Va.
Laura Renwick brings with her six rides across the CSI2* and CSIYH*, including the 8-year-old gelding Alothain De Blondel with whom she won the Vilamoura CSI3* 140 in February this year. One to watch in the Young Horse classes will certainly be Claretina (Clarimo x Caretino) who, with Laura, has already clocked up six international 5-year-old this season. No stranger to wins at Keysoe and back to back Hickstead Speed Derby winner Matthew Sampson is making a name for himself as one of the quickest riders on the circuit. Matt brings his Bolesworth CSI4* winner Django Blue, the multiple young horse winner Budgie, along with the competitive rides on Ebolensky and Conlando 55. Competition runs from Tuesday 3rd July until Thursday 5th, with the feature €25,000 Grand Prix coming on Thursday afternoon. Entry for spectators is free of charge each day with tradestands from Devoucoux, Spillers, CWD and food and drink available.